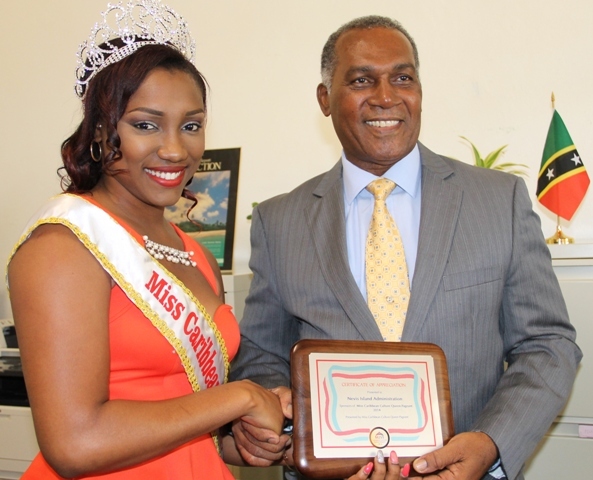 NIA CHARLESTOWN NEVIS (January 15, 2015) — Premier of Nevis Hon. 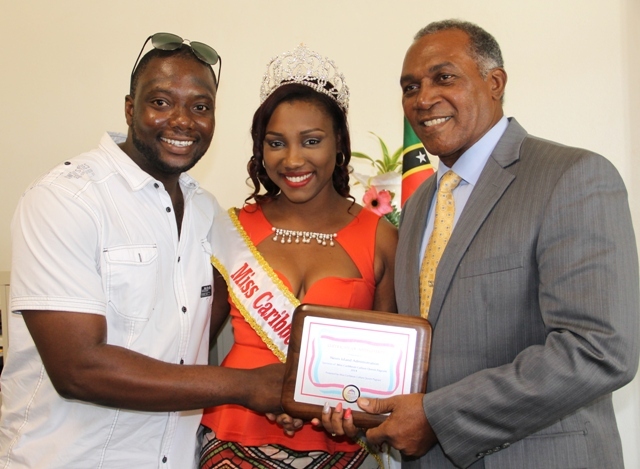 Vance Amory was presented with a token of appreciation from reigning Miss Caribbean Culture Queen Yarani Morton, for the courtesies extended by the Nevis Island Administration (NIA), at a cocktail reception for the Caribbean beauties who took part in the annual pageant during the island’s Culturama 40 festivities in 2014. During the brief presentation of a plaque at Mr. Amory’s Bath Hotel office on January 15, 2015, Morton thanked the Premier for his contribution to the show over the years. “We had a fabulous time at the opening cocktail. It was very well done and I would just like to say, from the bottom of my heart, thank you for your contribution to realising one of my dreams and to assisting Randy with bringing a little flavour to the Culturama activities for 2014,” she said. In response, Mr. Amory thanked the Caribbean Culture Queen for her gift and openly congratulated her for her win in the 2014 contest. He expressed the view that she would be an excellent ambassador for St. Kitts and Nevis and for the Nevis Culturama festivities. The Premier also used the opportunity to congratulate show promoter and local businessman Randy Jeffers, for his vision and commitment to the development of pageantry in St. Kitts and in particular Nevis, where he housed and located the Caribbean Culture Queen pageant. “I think Randy has done a wonderful job with attracting so many wonderful young ladies and putting on a good show, very professionally done, and I believe that with experience and continued involvement it will get better and better,” he said.